As we near the end of January 2012, I wonder how many people have kept up with their (or even started) News Years Resolutions. In my opinion, one of the hardest ones to stick with is weight loss/management. Why? It’s one that not only forces you to change your bad habits, but also your schedule. Like many of you out there, I made it a resolution to get into shape. More specifically, I want to finish my journey and never go back. Ever since a move we made in the Fall of 2010, I couldn’t get back into the groove. It’s not enough to chuck the cheeseburger and pick up a celery stick, you need to hit the gym, the park or the pavement; not the couch. For some, it’s hard to stop eating the mashed potatoes and stop being a couch potato. The first thing you should do is stretch your thumbs, because you’re going to get a workout from looking at the BlackBerry smartphone and BlackBerry PlayBook applications that App World has to offer. There’s definitely no shortage of fitness apps to be had. The key is to find the ones that offer the best workout and will have the most impact. That way you should have no excuses when it comes to shedding the pounds. While you’re warming up your thumbs, have a read through the Top 10 Fitness apps, all of which can be found at BlackBerry App World. This PlayBook application was developed to assist in the testing of the Air Force Physical Training. What is does is help users calculate a participants scores in their testing period. This simple to use app includes calculators for your BMI (Body Mass Index), Target Heart Rate, VO2 (peak oxygen uptake) and more. 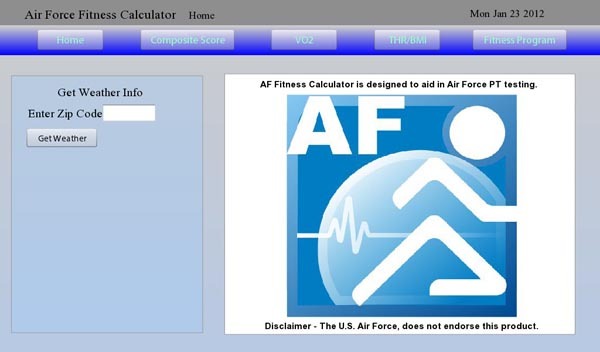 Now keep in mind that AF Fitness Calculator won’t grant access to Air Force Instructions, or even their fitness charts, but it gives you an idea of what you should be aiming towards. What it does give you, is access to the Air Force Fitness Program Portal. Have you heard of FitBit before? 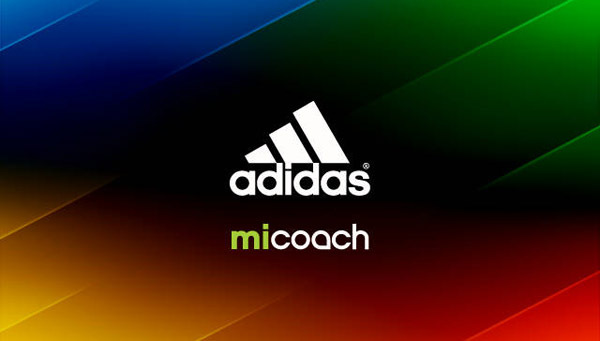 The company is dedicated to help people track and see their activity. Through their wearable products (called Trackers), and easily accessible sites, users can record and see reports on calorie intake/ burn, activities, foot steps taken, sleep and so on. 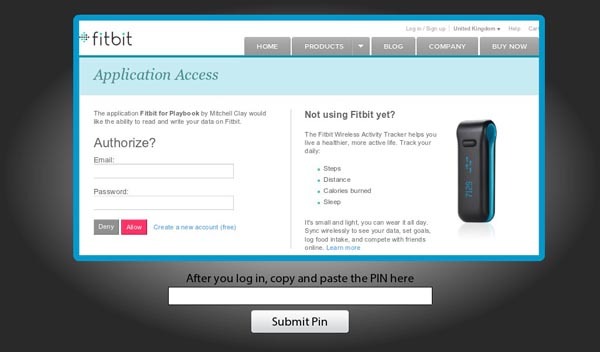 For mobile access, you can always hit up m.fitbit.com to manage your account. There is also a basic PlayBook application that helps you view your logs quickly. Through the unofficial FitBit app, you can log food/water intake and weight- hopefully we’ll see access to more options soon. You may need a visual aid or record to see your progress and where you can improve. Fitness and weight loss should never be done blindly. 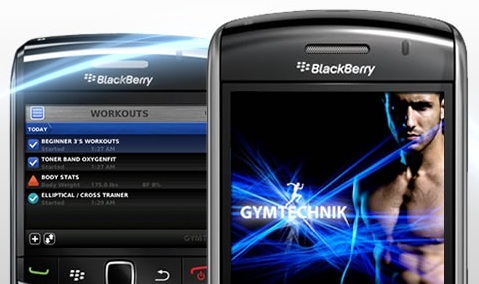 If you haven’t seen the name Gym Technik on the CrackBerry blogs, then you definitely haven’t been reading them enough! Over the years, we’ve reviewed their applications and watched them make vast improvements. They have been a strong support for the CrackBerry community, while getting fit. Sync with your existing Gym Technik account to access (or create) your workout plans, routine and results right from your BlackBerry smartphone. When it comes to tracking your results, the app offers a vast amount of choices such as; reps, weights, speed, distance and calories burned. You can then compare your results over time and see how you have progressed. 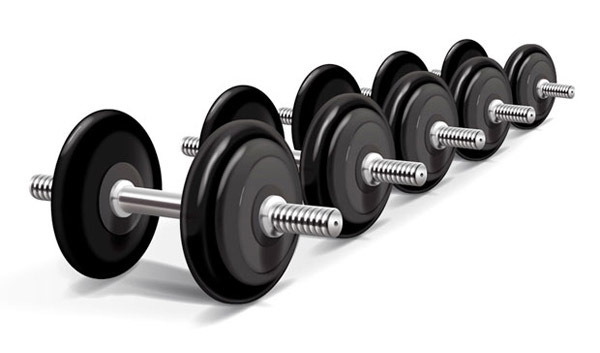 Gym Technik provides automatic Facebook and Twitter messages to promote your bragging rights. If you have a PremiumPlus account, your personalized workouts get pushed directly to your BlackBerry. It’s been a while since I last checked out AllSport GPS from Trimble Outdoors, but it looks like it’s still one of the must-have apps to use (hence why it’s included in this list). 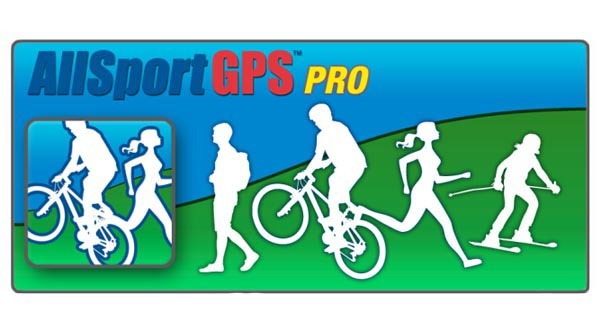 Tapping into GPS, you can log your activities such as Skiing, Mountain Biking, Walking and so on. You can then view stats and reports on items such as; lap speeds, average speed, elevation change, calories and active time ( to name a few). Though this app is available on most platforms, the BlackBerry smartphone version offers the most features, without having to upgrade to a pro account. Other options allow you to send turn by turn tracks, or rides found in Bicycling Magazine to your BlackBerry. The Trimble Outdoors community is the place to view and share routes and activities. One app I found very useful was FitDeck Bodyweight. Within this application is a card index of 50 exercises for the full body, or the upper middle and lower parts. No additional equipment necessary; just you and your BlackBerry smartphone. Okay, maybe you want to put on some clothes too- not everybody wants to see you stretch in your birthday suit. Each exercise has a visual guide and a set of instructions to follow with three levels of difficulty to attempt. The developer, mobileXware, also has a set of exercise cards for pilates, workouts at the office and even a deck for those who love stairs. If you find yourself more successful being social during workouts, rather than going at it alone, you can use an application like My Fitness Friends to reach out while you work out. Sporting BBM integration, the application allows you to share your routines with your contacts on BBM via your profile. Vice versa, your friends can post their routines, with which you can view and attempt to try out. You can then create friendly challenges and see who has the guts to slim their gut down. Now it’s not all just fun and games, My Fitness Friends gets down to serious business with dozens of exercises you can try individually, or combine them into a workout routine. Continuing on with the social side of fitness, we have joyFit. Currently in beta, the developer says that they are “about to change how people workout”. The app is part workout tracker, part social network and part game. Basically, the more you run the more points you get; the more points you get, the higher your rank. During game play, you can receive cash, with which you can purchase items that increase the rate you climb through the ranks. It’s an interesting concept, which will cause an increase of running BlackBerry users yelling “Oh yeah! I’ll show you!” Once you finish your run, you can share it with friends, so they can rate it or share via Twitter. This application acts as both a fitness log and as a motivator. It provides audio feedback to motivate you during workouts; you can also have message from friends read to you that can either motivate or hinder your progress. The competition heats up as you can attempt to beat the records on a specific route in order to become the route champion (kind of like a Foursquare Fitness Mayor?). More than just running or biking, you can record your results from snowboarding, weightlifting and more. On the social side of things, you can see what your buddies are up to and how they are performing. You can also share workouts via BBM or invite BBM contacts, as well. If you upgrade to the Pro version, you can then set a time or calorie goal; where your audio coach will keep you informed of your progress. You can also view graphs containing your speed, heart rate, altitude and lap times. Yes, this application advertises itself as a method of avoiding/curing common diseases but many, many people do yoga in order to stay fit. Developed for the BlackBerry PlayBook, this is an excellent resource for anyone. The exercises are sorted by ailment, which may be a bit of a pain when going through them. The information you have access to, however, is quite beneficial. Each exercise is explained with images, animation and a detailed description. I wouldn’t recommend trying to hold your PlayBook while trying out the poses, unless you have a protective case on it.